The focus of our Calabria & Basilicata tour is the territory of the “Magna Graecia” – the name given by the Romans to the coastal areas of Southern Italy – which is both one of the least explored and at the same time one of the most rewarding regions of Italy for the visitor. It is a region of often spectacular scenary and unspoilt lanscapes. It is also justifiably renowned for its fine food and rich culinary traditions. We meet in Naples in the morning and drive to Paestum. After lunch we visit the classical site of Paestum – originally known to the Greeks as Poseidonia (Ποσειδωνία in Ancient Greek), in honour of the Greek god of the sea – which exhibits three of the most well-preserved ancient Greek temples to be found anywhere in the world and utterly unmissable for anyone with even a passing interest in Ancient Greek history or architecture. Evening meal and overnight in Paestum. In the morning, we drive through the beautiful Cilento National Park stopping off at some stunning villages on our way to Matera. We are reminded of Carlo Levi’s Cristo si è fermato a Eboli or, as it is translated into English Christ stopped at Eboli – later made into a fine film by the Italian director Fracesco Rosi and surely one of the most important books of 20th century Italian literature. Levi was a doctor and a native of Turin, who in 1935, was sent into internal exile by the facist government of the time, to the village of “Gagliano” (actually Grassano). On arriving in the region, he was horrified by the poverty of the region, but despite being a political exile, Levi was welcomed with open arms by the villagers. By the time he left the village a year later, his opinions of the people had changed to one of great admiration and affection. We arrive in Matera in the late afternoon, with time to make some initial explorations of this fascinating city. Evening meal and overnight in Matera. Matera is said to be one of the world’s oldest towns: with remains dating back to the Paleolithic age and inhabited continuously for around 7000 years. We spend the morning visiting the town. The grottoes of the gorge were adapted to become homes, and by the 17th century it had become a prosperous town. But by the twentieth century more than half of the population were still living in these caves and the city became renowned for poor and backward. 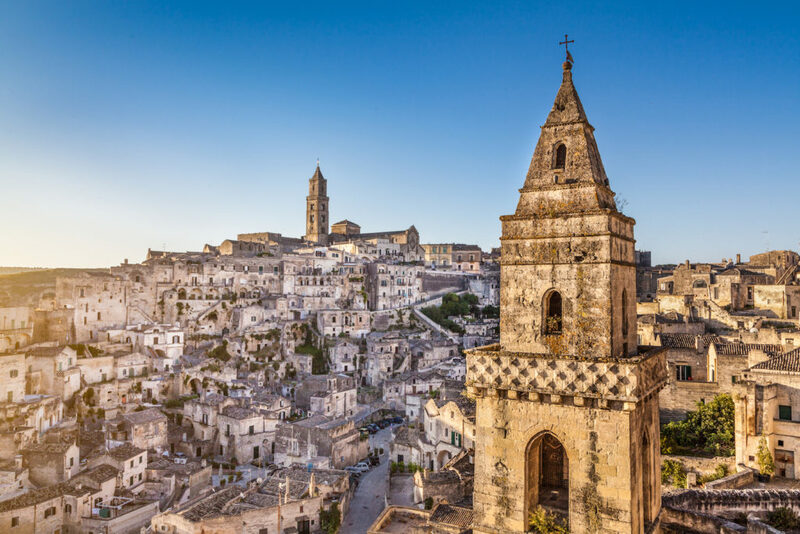 Recently named as Europe’s 2019 capital of culture, however, Matera has taken huge steps to unbridle itself from its past and is now very much a worthwhile town to visit. After lunch we drive to Metapontum where we visit the fine remains of another Greek temple: the Temple of Hera. In the late afternoon we depart for Terranova di Pollino where we stay in a small family-run hotel, deservedly renowned for its Southern Italian cuisine. It’s owner and chef, Pino, regularly appears on Italian television shows. Evening meal and overnight in Terranova del Pollino. We spend the morning visiting some charming corners of the Pollino National Park which is one of the great untouched areas of Europe. We also pay a visit to one of the fascinating local Albanian villages and learn about the old traditions. In the afternoon, there will be time to relax. We depart Terranova for Crotone and on our way visit the ancient town of Sibari. Although there is little to remind us now, the ancient Greek town of Sybaris (Σύβαρις) was an important city founded in 720BC by Achaean settlers and later famous among the Greeks for its hedonism, feasts and excesses. We stop off also at Santa Severina and there is time to appreciate its wonderful castle. Curiously, there is no saint named Severina in the Greek or Roman calendar of saints and we discover that the name derives from ancient Siberine (Σεβεριάνη) – of Sibari. In the afternoon, we visit the archaeological site of Crotone – the ancient Greek city of Κρότων, and most famous perhpas for being the home of Pythagorus, who founded his school here in 530BC. We depart from Crotone in the morning and drive towards Locri. We spend the afternoon exploring Locri – the ancient Epizephyrian Locris (Ἐπιζεφύριοι Λοκροί or The Locrians upon the West Wind) – another of the great cities of the Magna Graecia and which Plato called “The flower of Italy” due to the characteristics of the local peoples. We have a full day exploring the wonderful town of Gerace with its noteworthy remains of a Norman castle and fine churches. In the afternoon, there will be time to relax. Evening meal and overnight in Gerace. We depart from Gerace in the morning and drive to Reggio Calabria. In the afternoon, we visit the stupendous Riace Bronzes on display in the museum in Reggio Calabria. These are two full-size Greek bronzes of naked bearded warriorsfound in the sea near Riace in 1972 and dated to around 450-460BC. They are arguably some of the finest Greek statues ever to have been discovered. Drive to Reggio Calabria railway station in time for trains to Rome.